Night time sure brings out the critters in our neighborhood. 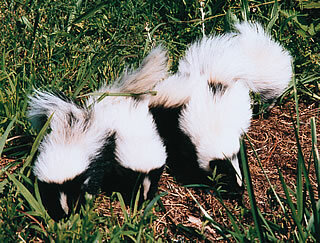 I was freaked out to discover there is a family of skunks living amongst us. I took out one of the dogs for a late night potty break and ran up on them in the driveway. It is an obvious mother skunk with 4 babies, although the babies aren’t tiny – they are about half the size of the mother. They are the weird mostly white color of skunks. Not like the Pepe Le Peu cartoon skunk that is almost all black with just a little white stripe. These skunks are about half white. At least that makes them easier to see in the dark – so I turned a 180 and cut short the potty break. This morning we detailed the yard and got up any and all trash or food source that they could get into and I replaced the lightbulb at the back door so we don’t walk out of the basement in the dark and unexpectedly encounter Mama Pepe or any of her brood.